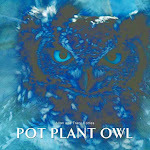 Pot Plant Owl: Day 45 - 16 Nov and aren't we well behaved? Since Merlin's grand adventure, with me as the reluctant Co-Pilot, our eldest chick has been well-behaved. I say 'well-behaved' as, in this instance, not gallivanting around the neighbourhood gardens and generally running riot. Merlin has been a good example to Timka, by being loving and cuddly, and above all, the chicks has remained on the balcony. This is good news- no, GREAT news - for me. It means enjoying a relaxing dinner, instead of shovelling mouthfuls of cold food into my mouth as I run from one side of the property to the other, tracking a wayward chick. It means waking up in the middle of the night and being able to go back to sleep again, after seeing two little bodies on the balcony. It means being able to enjoy a morning run instead of rescuing chicks. Timka is a honey. The chick hops, jumps, scratches,gnaws at, and tries to touch and feel everything it sees. We've seen fantastic 'shoe handling skills' that would rival any skills shown by professional soccer players. Timka continues to make use of the owl box - not only for exploration purposes, but also for the purpose for which it was made - for shelter. In the heat of the day, Merlin continues to struggle in the blazing sun while Timka sleeps restfully in the owl box. Love the updates, Tracy. Glad to see Merlin settled down a bit to give you a break. Yes if they could remain as long as possible on the balcony.